Big news for China yesterday as the end of the one-child policy was announced after being in force for 35 years. As a political scientist, China business specialist, and also as a woman with family in China, I of course have something to say about it. First, as a liberal, I have never approved of government intereference in the private arena. Child bearing is far too important a thing to be left to the government to rule upon. It's about human freedom, and more specifically, women's rights. Yet, looking back at the situation in China in the 70s, I understand why this one-child policy was implemented by the Communist Party in 1980. The one-child policy has granted children born in this era more ressources their parents and grandparents could have ever hoped for. We need to bear in mind, it's not only the ressources of the parents, but those of the four grandparents that go directly into providing for every need the child may have. The one-child policy, by providing demographic stability, has helped Chinese be better off in terms of education and economic prosperity. Yet, everything comes with a price. Forced abortions and sterilization are only some of the horror stories this policy has generated. Others include babies in drainage pipes, or parents whose world comes to a complete end if their only child happens to die or becomes disabled, for the sustenance of parents after retirement relies exclusively on their children, as I will explain below. With Liam's cousin, Hang Hang, in early 2013. He was two months younger than Liam is now. As I mentioned at very beginning, this policy change affects me in a personal way as well. Even though I married a Hong Kong man and not a mainland Chinese one, both of J's parents come from China (his dad was born there, and his maternal grandma too), as do many other Hongkongers. Liam's little cousins from Guangdong are an example of some of the craziness this one-child policy generated. In a country with no retirement funds for the elderly, the only hope to a decent retirement is the money children provide their parents with. You may not know this and it may come as a shock to you if you're not familiar with Chinese culture, but it is customary for Chinese kids, once they start working, to give a percentage of their salary (around 20-30%) to their parents for the rest of their lives. It is only reasonable that some Chinese families would prefer having two kids rather than one. When my cousin-in-law gave birth to her precious baby boy, (Hang Hang pictured above), in early 2012 (the first month of the Dragon year), we couldn't be happier for her family. Yet we soon discovered that she and her husband were planning to conceive again as soon as possible hoping they could somehow make the two kids appear officialy as twins, the only way to legally have two children without having to pay a fine. Said and done, she was pregnant again just two months after giving birth, and her second son was born on the last month of the Dragon year. If you're familiar with Chinese culture, you may think they were so lucky, for they got two little Dragons, the best zodiac there is. Yet, there is so much more to the story. These so close pregnancies posed a strain on my cousin-in-law's health, for a woman's body is not fully recovered to experience a new pregnancy until at least 18 months after giving birth. Her second pregnancy left her with little strenght to look after her first son, who spent most of the time being taken care of by his grandma. I know she's not the first nor the last woman in the world to have two kids less than a year apart, but I do believe this should not be a decision based on an unfair government regulation. You must know that the plan to make the two brothers pass as twins never succeeded. It was not possible for them to find a way to bribe an official into falsifying the birth papers, and they ended up charged with a fine that amounted to almost all of their live savings. As if this was not enough, Hang Hang was diagnosed with autism some months ago. I do not know if this had anything to do with the fact of his mom being absent during his first months of life as a result of a new pregnancy and a new child, as well as not being able to breastfeed him for the same reason, but I do know I can't prove the opposite either. I must admit reading the announcement of the end of the one-child policy made my eyes wet. I couldn't help but think about our Chinese family, not only how my cousin-in-law's life could have been different should this announcement have been made some years earlier, but also about other cousins who have one child and will probably try to welcome a new one anytime soon. I can't deny it, yesterday was bittersweet. This weekend Barcelona people have been lucky enough to yet another year being able to celebrate the Architecture Festival, also known as 48h Open House Barcelona, in which hundreds of buildings with architectural interest are open to the public. 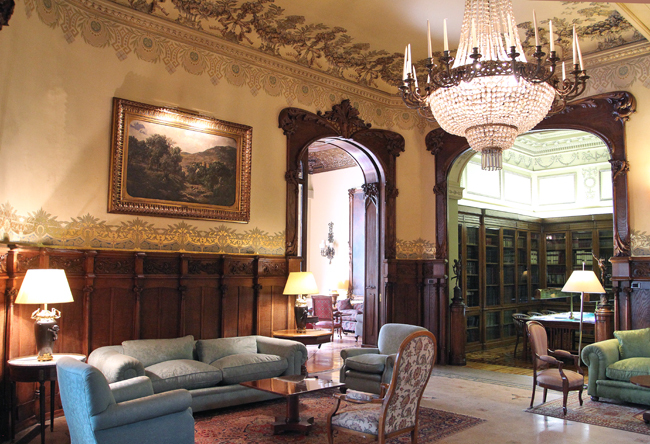 This year we chose a beautiful house from the beginning of the 20th century located in the corner of Balmes with Diagonal, nowadays known for the social club that owns it: Círculo Ecuestre. This amazing romantic creation was built in 1910 for a Catalan family who had made their fortune in the Philippines when it was a Spanish colony, that is, up to 1898. 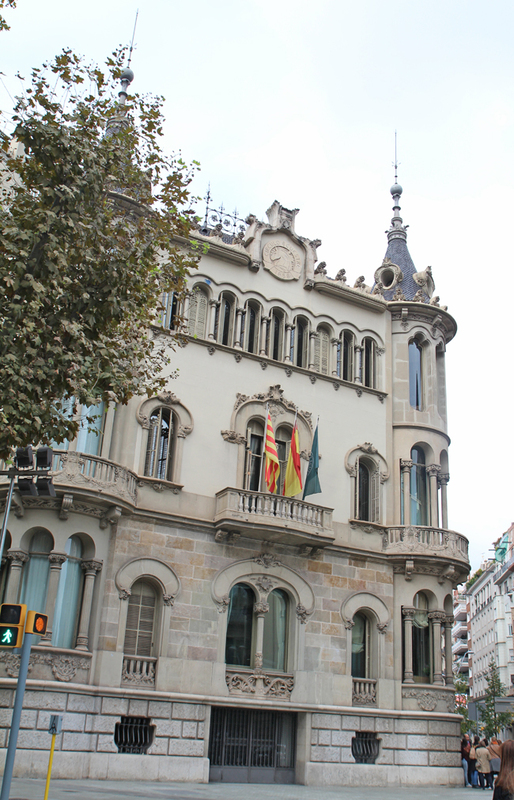 Once the Philippines became independent, the family decided to come back to Barcelona and build this little palace for their own use. 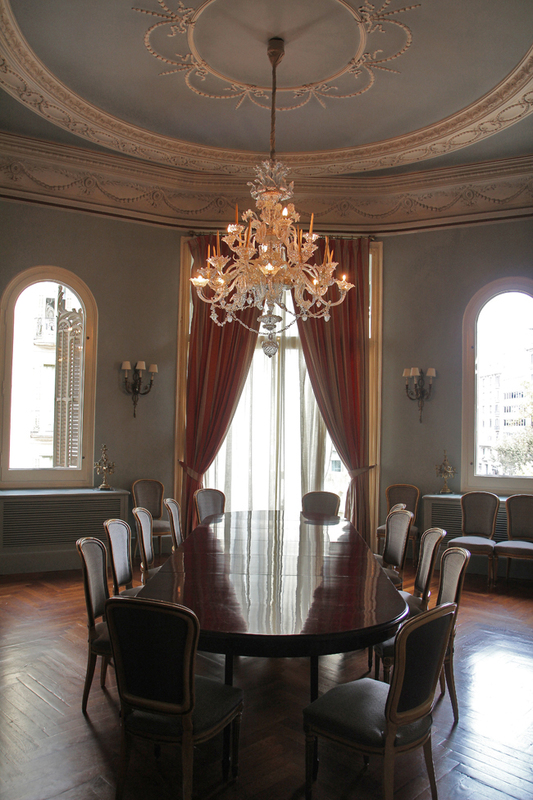 Círculo Ecuestre, a social club mostly for men for networking, do business or simply relax, bought the building in 1947, and it has been its HQ ever since. It's been two years since J and I tied the knot in beautiful La Garriga de Castelladral. October 6th, 2013 continues to be one of the best days of my life, and it will probably always be. These two years have been very different from one another. The first one was the absolute bliss. We were newlyweds, I was expecting a child, and we spent the whole day daydreaming of what was to come while enjoying our, still, two people's world. With the birth of Liam came the biggest of our joys, yet our world would never be a two people's one ever again, and things got a bit strained. Nowadays, we still fight more than I wish we did, but we're also much better at handling our little family of three. I must say J does an amazing job as a daddy. I don't think there's much dads out there who help with everything just as much as J does. For that I am so grateful. May our love continue to thrive and may we become any hardship that comes our way. J, I love you and I always will.